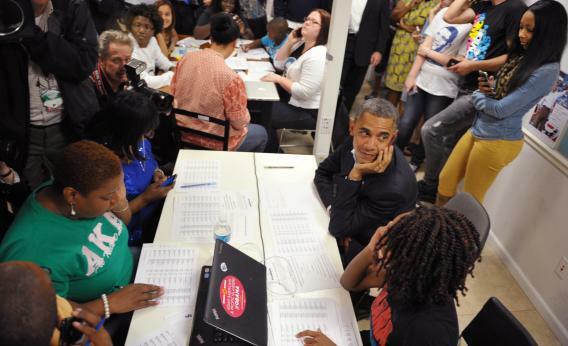 Obama's volunteers: they're being used not only to get out supporters, but to persuade undecideds. Barack Obama calls a volunteer during an unannounced visit to a local campaign office in Orlando, Fla.
I’ve been quiet here recently, largely because I’ve been busy working on a story that went up yesterday. It brings together a few things I’ve been wrestling with throughout this election year, specifically trying to come up with a solid systems and culture explanation for why the left has such a monumental tactical advantage over the right today. It’s a big change in how campaigns think about what they can accomplish with field. When Obama’s staff brag about all those campaign offices, they’re not just thinking of them as registration and mobilization hubs but centers for targeted persuasion. Unlike most campaigns, they aren’t necessarily counting on television, direct mail and free media to do the work of changing minds.